The words "autonomous, programmable, humanoid robots" might not sound like the best description of a new tool in helping children with autism, but that's exactly what NAO robots are. UNCW Assistant Professor Amelia Moody and her team of researchers have acquired six of these robots to utilize in a Wilmington after-school program that helps autistic children with their studies. Utilizing technology and visuals when teaching children with autism has proved successful, and the NAO robots have both of these aspects rolled into a 28-inch human-like machine. 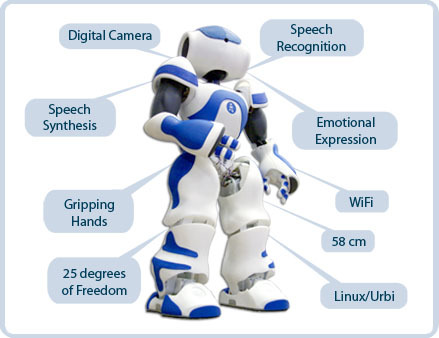 The robots, which come equipped with a digital camera, speech synthesis, gripping hands, 25 degrees of freedom, speech recognition and WiFi can speak, listen, express emotion, see and follow directions. One of the more interesting things the NAO robot is capable of is Tai Chi, a type of Chinese marital art practiced for both its defense training and its health benefits and known for its slow movements. Being able to practice Tai Chi requires the NAO robots to have balance and coordination. Working with her team, Moody, an assistant professor in the Early Childhood and Special Education Department and Director of the Assistive Technology Demonstration and Lending Site, can program specific adjustments and commands for the NAO robot to enhance social engagement with the children of the study. Playing the game "Simon Says" is one of the main aspects of Moody's research. The research team will examine engagement and communication during social interactions amongst the children while they play with the NAO robots. The goal will be to see if the children can appropriately and effectively interact with the robots and friends, follow directions and give directions. Once the robot is removed from the classroom, the hope is that the children have learned these engagement and communicative behaviors and can generalize these skills to learning environments and social and situations. The goal, Moody says, "is to see if robots can bridge the gap and enhance social communication and engagement." The robots are hypothesized to help improve the children's engagement, attention, enthusiasm and verbal communication skills. The children working with the NAO robots are students of OASIS, NC, "an inclusive, after school social-communication program created especially for children with autism that allows them to generalize and practice the social skills they have been taught in school." The students are all between kindergarten and fourth grade. The study should take a few months, but because Moody and her team's results are dependent on how the children react, timing is a little up in the air. Because the NAO robot already has a video camera attached, this footage will be used to collect and later code the data. Moody is constantly looking for technologies that help students gain access to the general curriculum, and the NAO robots are an advanced form of such technology. UNCW owns six NAO robots, which can run a price tag of higher than $15,000 each. Because this is too expensive for most families to buy for a child with autism, Moody hopes with further research and funding that the technology will be implemented in schools and after school programs like OASIS, if effective.